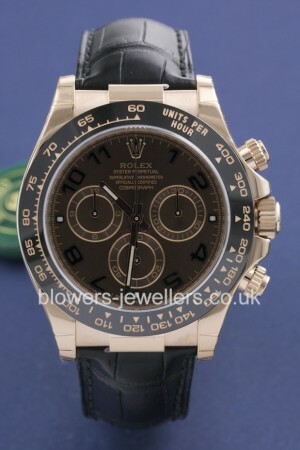 18ct Rose Gold Gents Rolex Oyster perpetual Cosmograph Daytona 116515LN. Case diameter 40mm water resistant to 100 meters. Automatic Chronometer chronograph movement. Chocolate dial with chocolate sub-dials, luminous hour markers and hands. Black monobloc Cerachrom Tachymeter bezel. Black Rubber B Strap 18ct folding clasp. Box and papers dated August 2015. Our reference S22499. SKU: 3006251. Categories: Daytona, Rolex.